1 Impact & Chrome Sockets. Alternator Belt & Pulley Tools. Axes Adze Felling & Splitting. Brake & CV Service Tools. Bungees Tie Downs twine & Rope. Rack Sash & T Clamps. Nuts Bolts & Washers ETC. Fuel & Air Conditioning Tools. Furniture Paint Polish & Wax. Glue Guns & Glue Sticks. Heating & Cooling Gas Electric. Hex Sockets & Hex Key Sets. Home & Car Care Products. Locks & Lockout Tools & Safes. Markers Marking Out & Squares. Oil & Grease Service Tools. Pets Pest & Rodent Control. Pipe Cutters & Pipe Wrenches. Saws & Saw Blades All Types. Shot Blasters & Parts Washers. Signs Tags Labels & Stencils. Spanners Hook & Caliper Face. Spark Plug & Ignition Tools. Timing Setting & Locking Tools. Belt & Pulley Tools ETC. Tin Snips Metal Cutting Tools. Tool Boxes Trolleys & Creepers. Torx Sockets & Torx Key Sets. Vices Wood Metal + Accessories. Wheel & Hub Nut Tools. Drill Bits Auger Bits & Sets. Wood Care Brushes & Paints. 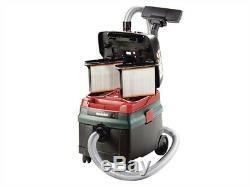 Metabo MPTASR25SC ASR 25L SC Wet & Dry Vacuum Cleaner 1400W 240V. The Metabo ASR 25L SC Wet & Dry Vacuum Cleaner 240 Volt Version. The Metabo ASR 25L SC Wet & Dry Vacuum is suitable for liquids and dry solids with commercial registration. Ideal for mobile use due to low weight and compact construction. Automatic shut-down when vacuuming liquids once the maximum filling height is reached. Certified in accordance with EU standard for dusts of dust class L. Also features an auto take-off enabling the use of a power tool in conjunction with the vacuum. Fitted with two polyester filter cassettes that have a large filter area for constantly high suction capacity. Its automatic trailing mechanism makes sure the suction hose is completely empty. Antistatic basic equipment prevents static charge when using appropriate accessories. SelfClean function for semi-automatic filter cleaning during breaks for next use. Supplied with: 1 x Suction Hose 35mm x 3.2m, 1 x Handle Adaptor, 2 x Plastic Suction Pipes, 2 x Polyester Filter Cassettes (M Class), 1 x Nylon Web Filter Bag, 1 x Grouting Nozzle, 1 x Universal Nozzle. Input Power: 1,400 Watt. Max Air Flow: 3,660 l/min. Top Rated Tools is a tool supplier based in North Yorkshire, and has been an online presence since 2003. We have multiple online stores and offer a comprehensive selection of items covering all needs including: Home & DIY, Industrial, Mechanics Tools, Gardening, Building Supplies and much more. If you can't see it on the site please let us know as we can usually source it for you! As a small business you know you will be able to deal with the same member of the customer service team with your problem rather than waiting on hold or having to deal with an automated call centre. Our experience has allowed us to develop strong professional links with the top suppliers of tools in the UK, we offer items from a range of top quality tool companies. We cover all bases from cheaper DIY Tools to top-end industrial parts. Take a look and rest assured we will do our best to provide a one-stop shop for all your needs! We will dispatch items within 48 working hours of the order being processed. We process all order up until 2.30pm, after this time the order is processed the following day. As Christmas approaches, we understand the importance of knowing whether your item will arrive to you before the big day. You must remember there is also the dispatch time to include when making your order, this is displayed in the listing. Tuesday 4 December- Africa, Middle East. Friday 7 December- Asia, Cyprus, Far East, Japan, Eastern Europe ex. Poland, Czech Republic and Slovakia, Malta. Saturday 8 December- Caribbean, Central & South America. Monday 10 December- Greece, Australia, New Zealand, Turkey. Friday 14 December- Canada (SUBJECT TO STRIKE), Czech Republic, Germany, Italy, Poland, USA. Saturday 15 December- Finland, Sweden. Monday 17 December- Austria, Denmark, Iceland, Netherlands, Norway, Portugal, Slovakia, Spain, Switzerland. If you are looking to return an item or you would like to send us a cheque or postal address please send to the address on the front of the package or the invoice inside. Milwaukee MILM12HV0 M12 HV-0 Hand Vac 12V Bare Unit. Karcher KARWV2 WV2 Window Vac. Einhell EIN2351152 Dust Bags For Vacuums Pack of 5. Sealey CPV72.01 Foam Filter for CPV72. Sealey PC200CFL Locking Cartridge Filter for PC200 & PC300 Series. Sealey DFS/AK10 Vacuum/Dust-Free Tool Adaptor. Metabo MPTASRBAGS Paper Filter Bags For ASR Wet & Dry Vacuum Cleaners Pack of 5. Sealey PC310CF Cartridge Filter for PC310. WHAT OUR CUSTOMERS ARE SAYINH ABOUT US. Stanley Tools STA197486 Stackable Sort Master Junior Organiser Bonus Twin Pack. Sealey SM1305B10 Bandsaw Blade 2240 x 12 x 0.6mm 10tpi. Milwaukee MIL430882 SHOCKWAVE Impact Duty Bits TX25 50mm (Pack 10). È tutto perfetto è un vero piacere fare affari con questo venditore. Stanley Tools STA130686N Tylon Pocket Tape 3m/10ft (Width 13mm). Plasplugs PLASCP120 SCP 120 Thermal Block Fixings (10). Good quality and fair price! DEWALT DEWDT20700 Multi-Tool Sanding Platen. Starrett STR162B 162B Pin Vice 0.8-1.6mm (0.030-0.062in). Sealey DB010FG HSS Fully Ground Drill Bit 1mm Pack of 10. Sealey DB015FG HSS Fully Ground Drill Bit 1.5mm Pack of 10. The item "Metabo MPTASR25SC ASR 25L SC Wet & Dry Vacuum Cleaner 1400W 240V" is in sale since Saturday, July 30, 2016. This item is in the category "Home, Furniture & DIY\Appliances\Ironing & Vacuuming\Vacuum Cleaners".